When designing an all-in-one PC, many manufacturers focus more on aesthetics than performance. 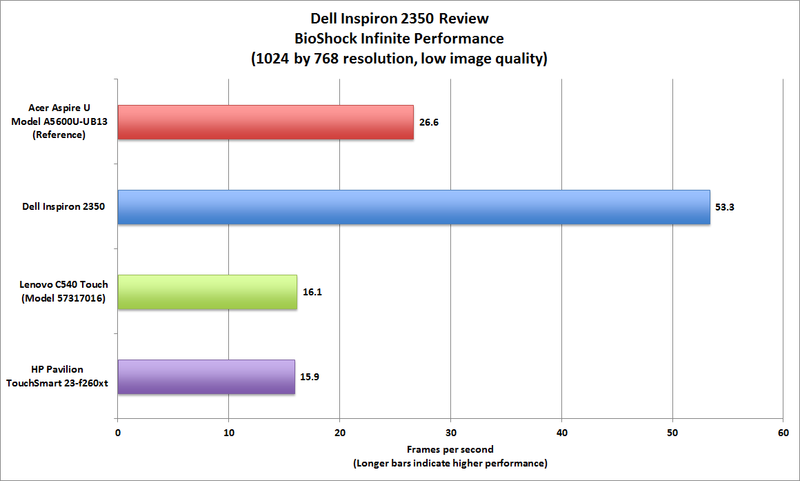 That’s certainly not the case with Dell’s 23-inch Inspiron 2350—at least not for the high-end configuration we tested, which racked up both impressive benchmark scores and high marks for style. The visual appeal derives in large part from its exceptionally thin profile for a 23-inch all-in-one touchscreen desktop: It’s less than a half-inch thick at its edges, and barely one inch thick everywhere else—not quite as razor thin as the new iMacs, but certainly slender by Windows 8 standards. 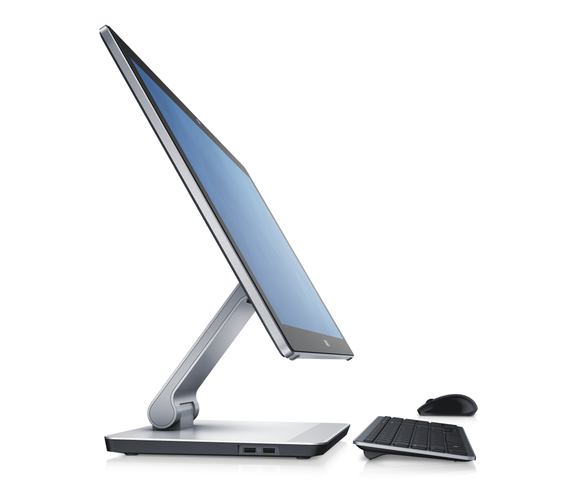 (Dell also sells a non-touchscreen model that’s a tad skinnier.) Moreover, its sturdy, articulated stand lets you adjust it pretty much any way imaginable, from nearly flat against the 10.5-by-9.5-inch base to upright and perpendicular. The wireless mouse and keyboard eliminate cable clutter, and because Dell has placed all the ports in the base (four USB 3.0, an 8-1 memory card reader, and headphone jack on the sides; plus two USB 2.0, gigabit ethernet, audio line-in, and HDMI-in and -out in the rear), no wires dangle from the display. The keyboard is definitely smaller than those provided with most desktops, but its slightly sculpted keys are still spaced sufficiently for comfortable touch typing. All told, the sleek, silvery-accented black chassis will make for an appealing home or office companion no matter which configuration you choose. 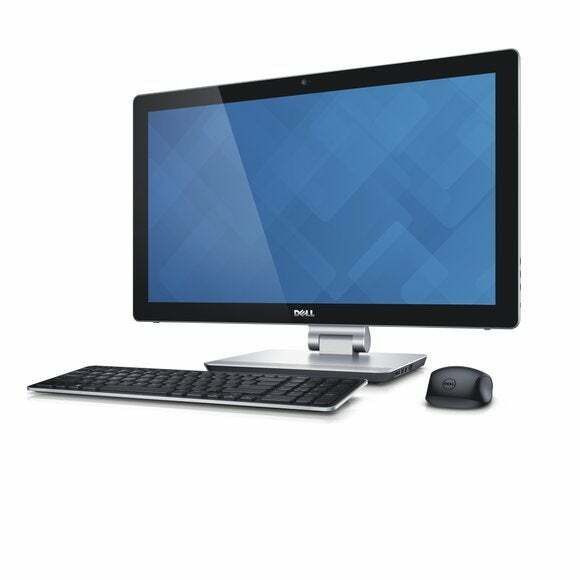 Of the three available starting at $999, Dell sent us its high-end $1399 model, with an Intel Core i7-4700MQ CPU (one of its higher-end quad-core Haswell mobile processors), 12GB of DDR3/1600 memory, and a discrete AMD Radeon HD 8690A graphics card with 2GB of dedicated memory. A 1TB, 5400rpm hard drive with a 32GB solid-state cache makes for swift startup. The system earned a Desktop Worldbench score of 232, more than twice the 100 score of our reference system, an Acer Aspire U (model A5600U-UB13). We’ve seen several gaming rigs score produce Worldbench scores in the 300s or even 400s, but the Inspiron 2350’s performance is more than respectable as all-in-ones go. It did particularly well in the PCMark 7 Productivity Suite and Storage tests, and the boost from discrete graphics was easily apparent in the GPU accelerated image-editing test, which ran more than twice as fast as the test without GPU acceleration. Gaming scores for the 1920-by-1080 display were also much better than we typically see with a mobile processor, since many all-in-ones don’t come with discrete graphics. Again, this isn’t a machine for hard-core gamers, but playing a first-person shooter or other game shouldn’t be as frustrating as it can be with many PCs that use mobile components to stay slim. 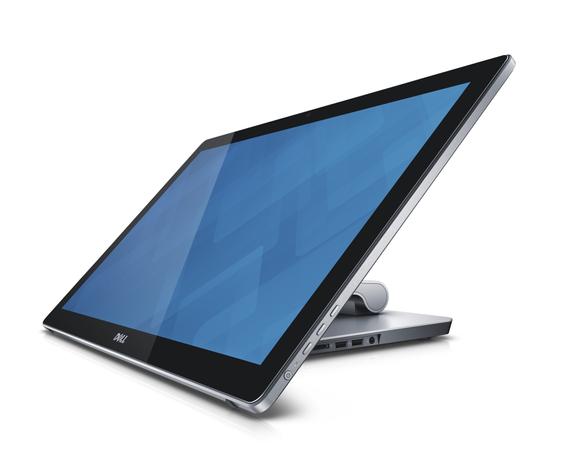 The Inspiron 2350’s touchscreen looks bright, and its 10-point capacitive touch surface responds alertly to multi-touch gestures. Audio from the stereo speakers set in the base sounded good, with minimal distortion at higher volume. The integrated 2.1-megapixel webcam comes with minimal controls, but it captured decently lit images for Skype video calls. Of course, the image looks grainy when displayed full-screen, but that’s hardly surprising given the size and resolution of the display. A few disappointments: Given the many upscale design choices Dell has made here, it’s a bit surprising that the Inspiron 2350 lacks support not only for the latest and fastest Wi-Fi standard (802.11ac), but for 802.11n on the 5GHz band (you get 2.4GHz 802.11b/g/n only). That should give pause to buyers who were planning on using Wi-Fi in crowded network environments, where 2.4GHz connections can often step on each other. You might want to consider augmenting this machine with a dual-band USB Wi-Fi adapter. You also must do without a built-in optical drive, although Dell will happily sell you an external one as an accessory. 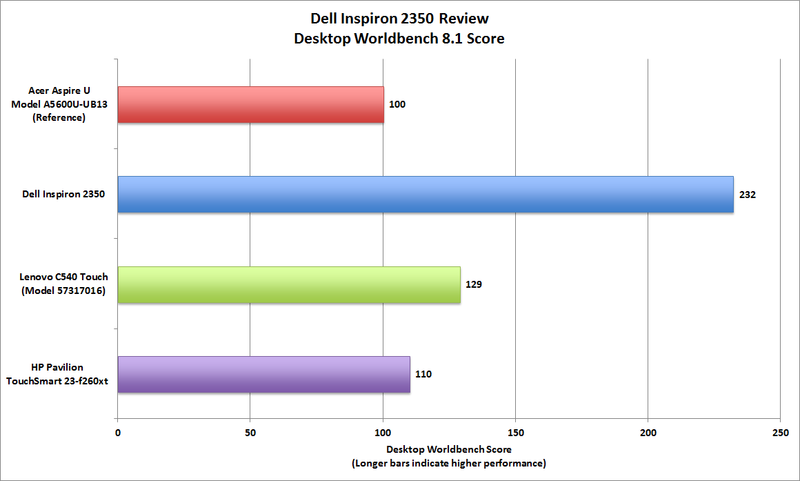 Those caveats aside, the Inspiron 2350 stands out as a solid performer in a field of mostly sluggish all-in-ones. If you’re looking for a stylish desktop that won’t fold under the pressure of computationally intense workloads—and you’re willing to pay a modest but justifiable premium—the Dell Inspiron 2350 is well worth your consideration. The Inspiron 2350 is an appealing choice if you're looking for a stylish desktop computer with number-crunching power for the home or office.